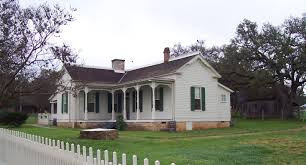 Gather the family and come out to Lyndon B. Johnson National Historical Park to celebrate the holiday season at “Christmas Through the Years in LBJ Country” on Saturday, December 10, in Johnson City, Texas. This National Park Service centennial celebration will run from 6:00 to 9:00 pm. The special event is free and open to the public. It takes place outdoors at 200 Elm Street in Johnson City on the city block where young Lyndon Johnson came of age. The president’s Boyhood Home will be open for lamplight tours. 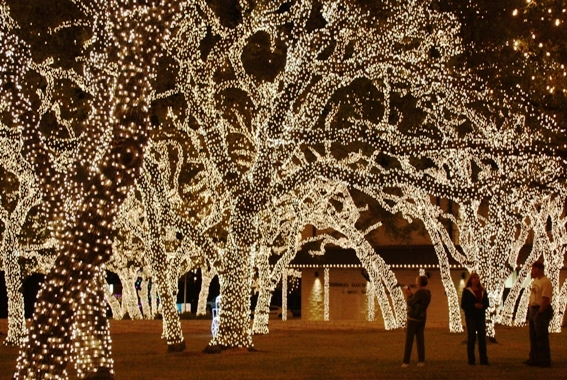 Next door is the Pedernales Electric Cooperative headquarters, where thousands of Christmas lights illuminate stately live oak trees. Christmas was a special time for President and Mrs. Johnson and their family. This year the National Park Service carries on the Johnson family’s tradition by making the holiday season special for locals and “out-of-towners” alike. If you haven’t been to Johnson City during the holidays, this is a great chance to visit. Christmas glows for the 23rd year during the annual Lights Spectacular presentation, which runs from November 25. 2016 through January 1, 2017. 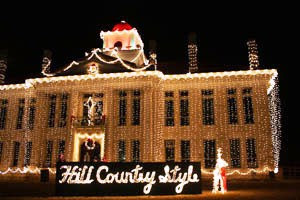 More than 100,000 lights sparkle on the Blanco County Courthouse, centerpiece of the display, while Pedernales Electric Co-op’s Headquarters boasts a twinkling forest with over one million lights. Practically every inch of tree bark and limbs is covered with tiny white lights, and larger bulbs gleam through the branches. This local celebration will cap the National Park Service’s year-long centennial celebration. Brian Black of Bandera, Texas, a music artist who has opened for and played with a number of renowned musical artists, will perform. Top 3 photos by Larry and Beverly Burmeier. LBJ home from free source.